I am finally back on my knitting, and have managed to finish sock number 1 of my Hiya Hiya sock KAL and have cast on for sock number 2. 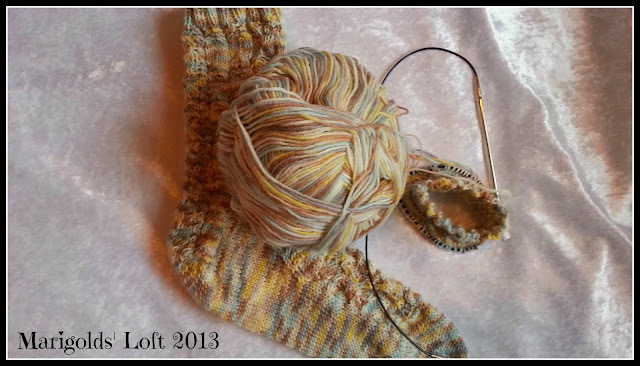 I hope to have this pair of socks completed soon as I want to get cracking finishing my Stash-Busting list for 2013. These socks are also stash-busters but not planned for, and not out of the drawer that I want to empty! I still have a couple more projects on the list and I want to be just about done before the end of the year - which as we all know is screaming up to us at a rate of knots! I can't wait to see all these amazing creations. From Wednesday 27th November onwards I will have a Linky Party going so that as you receive your gifts you can show us what you got! I hope you all have a wonderful rest of your week ahead of you. 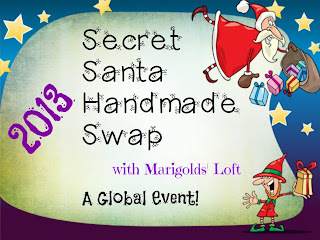 I do hope you will join in the Party happening here tomorrow, come on in an link all your "Festive" tutorials for a feature at the end of the month! I feel with you, I too am there each year, time just seems to speed up really quickly come October doesn't it? Great color and they looks so soft. Thanks so much for visiting, have you got your doggy yet? I'm definitely joining the gift swap next year. With all the gifts I was planning for this year I knew I wouldn't be able to squeeze another in. You look like you're getting huge chunk of knitting done on your list. It will be great to have you on board with next years swap, it is so much fun! Well done with all your projects you have accomplished so far too - amazing! gorgeous sock yarn! I love the list and the crossing off--nothing like a productive list!! What a beautiful color! Love the socks! And rock on with the stash busting! Have an awesome rest of your week and thank you so much for visiting. Lovely color! Good luck with the stash. That's a lovely sock pattern ... looks squooshy and comfy! I can understand that, it is like trying to stop eating chocolate and then just craving it even more!